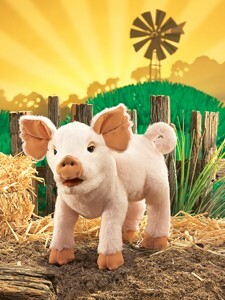 Folkmanis 2949 - With its sweet smiling face and curlicue tail, this PIGLET PUPPET is all yours to sing along with your favorite barnyard tunes, zip-line through the forest, or snuggle in your arms. Measures 15" x 7" x 10". Movable mouth and forelegs.